With impressive specifications, this is one among the more sought after tubs for the quality, the comfort levels and the ease of setting up which does not require any tools. Many features stand out in this model, including the ability of the tub to maintain the temperature after it has reached a specific level. Takes a little longer to get the water heated up, which could be shortened. With 120 bubble jets located on the inside, you can look forward to a truly amazing experience in this tub. With an advanced heating adjust system, you will find that the water temperature is just right, not too hot, nor below the required levels. The three ply laminated material is resistant and puncture proof, giving it greater durability. From the stable of Intex, with a model already featured at number two on this list, this is another superior product with the added luxury of 4 massaging jet streams that enhance the experience inside the tub. The in built systems, such as the water filtration and treatment of hard water in addition to the salt water sanitation system makes this one among the more skin friendly tubs, permitting longer sessions. Needs careful installation prevent leaks due to rough surfaces. Needs to be a bit more durable. This is another of those models that does not require any complex installation procedures. Just make use of the spa pump to inflate the tub, and operate the controls through a simple digital panel. The in built water filtration and fast heating capacity make the experience a lot more interesting and fully rejuvenating. The noise levels of the pumps needs to be addressed, as this can be unsettling for individuals looking for a good experience. 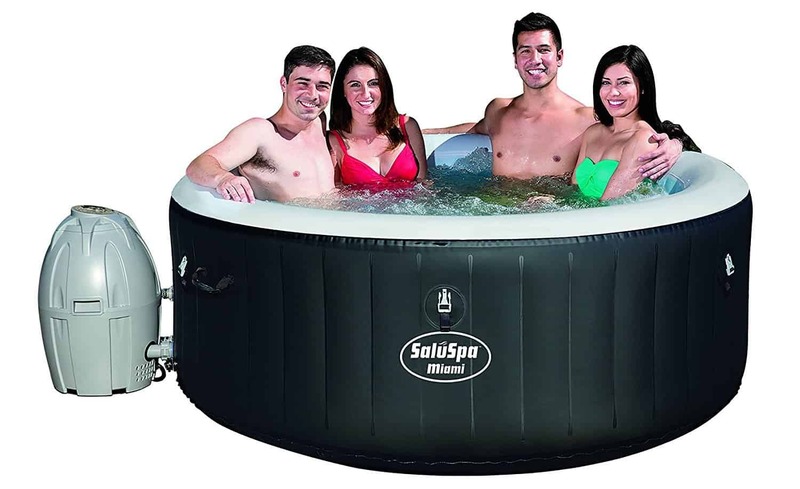 From the stable of SaluSpa, one of the standout features of this model of inflatable tub is its ability to heat up real fast and maintain the temperature effortlessly. One of the issues faced by individuals in tubs is the loss of heat or sliding temperatures due to the number of people in the tub or the release of heat. That has been tackled in this model by automatic heat adjustment which ensures that the occupants of the tub will never feel the heating effects getting diluted. The cushioned air pad floor minimizes heat loss in addition to giving superior padding to the bottom of the tub. The auto shut off feature of the pump needs to have an override feature to permit users to exercise more control over its operation. 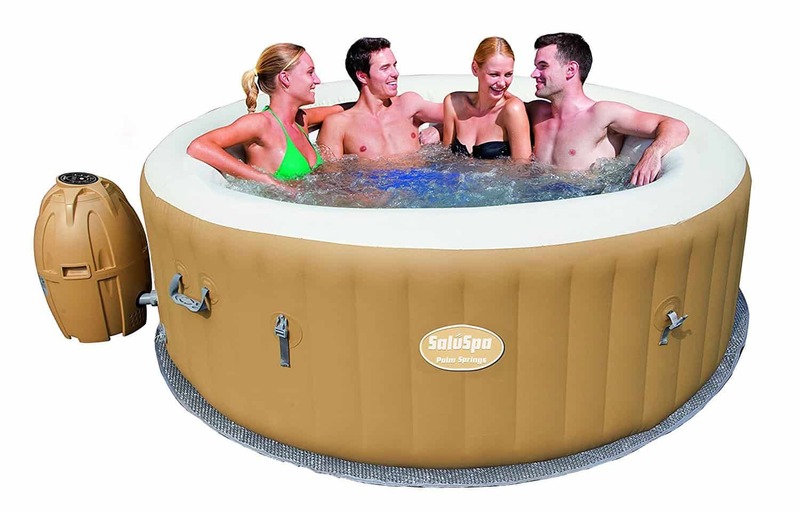 This list of five of the best inflatable hot tub reviews are compiled to bring out the main features and specifications of tubs to assist readers to choose the top rated inflatable hot tubs. The attempt is to highlight the features in a clear and unbiased manner. One of the biggest problems faced by users is the availability of a large number of models that may sometimes make it difficult for users to home in on the best model. This listing of the standout features will provide the necessary factual inputs. Our inflatable hot tub reviews can be used as a strong tool for comparison of features before zeroing in on the right model. Here are some of the features that need to be considered when opting for an inflatable tub. Portability – The tub needs to be portable, and when the term portable is used, it certainly means the ease with which it can be transported and set up or deflated. If portability requires a very heavy effort, then it cannot qualify as a portable product. One of the advantages of an inflatable tub is its intrinsic ability to be set up without great effort anywhere, in a home or outdoors for a great experience in the preferred surroundings. Ensure that the tub you buy will be easy to install and carry around whenever needed. Spa – The tub needs to offer adequate number of jet or bubble jets for users to get the experience of a spa. The number of such jets inside the tub need to on the higher side to give a truly unforgettable experience. As the tub may have its full capacity of 4 or 6 individuals, it will become necessary for every individual to experience the jet streams. For this to happen it is necessary for the tub to have adequate number of bubble jets. 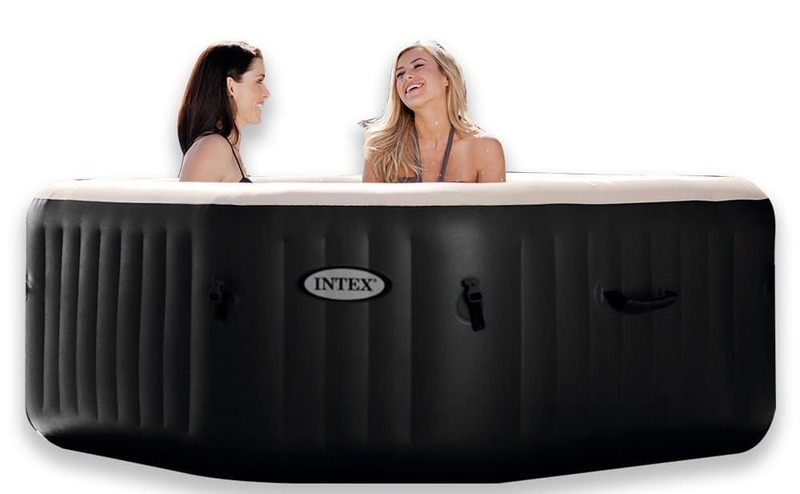 Additionally in this inflatable hot tub reviews we have featured models with extra jet streams for better massage options. Individuals who would like to experience powerful streams of hot water offer soothing massage, it would be a good choice to opt for the models that deliver greater creature comfort. Depth Of Tub and Strength Of Side Walls – The depth of the tub is another important consideration, If you opt for a very shallow tub, you will find that it is suitable only for children. For adults it is necessary to go in for a tub that is deep enough. And the depth of the tubs should never result in lowered heating capacity. Our inflatable hot tub reviews takes care to list out the features of models that are made with special side construction designs and materials. Tubs are meant to enhance creature comforts in a home through greater relaxation, and one of the experiences that individuals would love, would be to side atop the side walls and dangle one’s foot into the relaxing hot water. Choose a tub that is built strong with a sturdy design to accommodate an adult on the side walls. Heating Capacity – The heating capacity of the tub needs to be given adequate weightage. Ensure that the design assures constant heat and controlled heat after it has reached the desired temperature levels. Heat will escape through the air and through poor insulation. The right tub will have proper insulation and an automatic or timed heating option which will control the heat of the water to give a truly incredible experience to users. Durability – The durability of the tub should e one of the most important considerations. This can be verified by looking or ascertaining the quality of the outer structure, the number o flayers and ply that is used. This will give it greater durability. Other factors that need to be considered include the ability to resist punctures. Due to its portable design, you may tend to take it outdoors or position it wherever you feel will be the best place to have a great experience. If the material is not puncture proof or durable, it is likely to get damaged by sharp objects leading to permanent damage. Water Filtration And Pumps – As you may be spending a lot of time in the tub, it is necessary that the tub come with in built water filtration and treatment options. Having to separately treat the water may be a bit of a chore and you will lose interest in the sessions, if you have to spend a lot of time preparing the water. Therefore, choose a system that comes with an inbuilt water filtration and sanitation system. 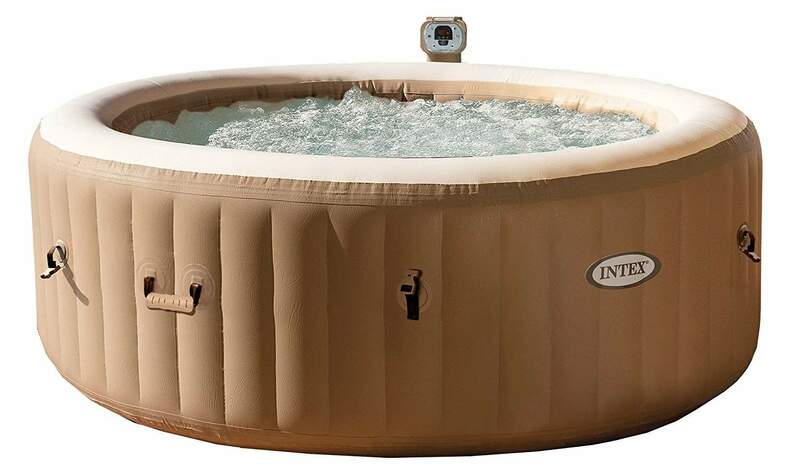 Our inflatable hot tub reviews features products that treat hard water, making them more skin friendly, permitting users to stay in the tub for longer sessions without having to apprehend any skin ailments. The pumps need to be effective and last long. Some of the products that did not make it to this list were those with defective or poor quality of pumps. This list of five of the most preferred inflatable hot tub has been put together after carefully considering various facts, different specifications and the actual performance of the tubs in a manner that is unbiased. Actual user reviews have been analyzed to understand problems that are recurring in nature and problems that could have arisen due to shipment and handling. The claims of manufacturers may sometimes be a lot different from the actual experience of users, and our reviews take a look at the gap to understand the issues. This gap also determines the ratings of the products, in addition to the pricing which is a contributor to the overall ratings. While price alone cannot determine a products rating, it does matter to individuals who may want to make a purchase on a limited budget. 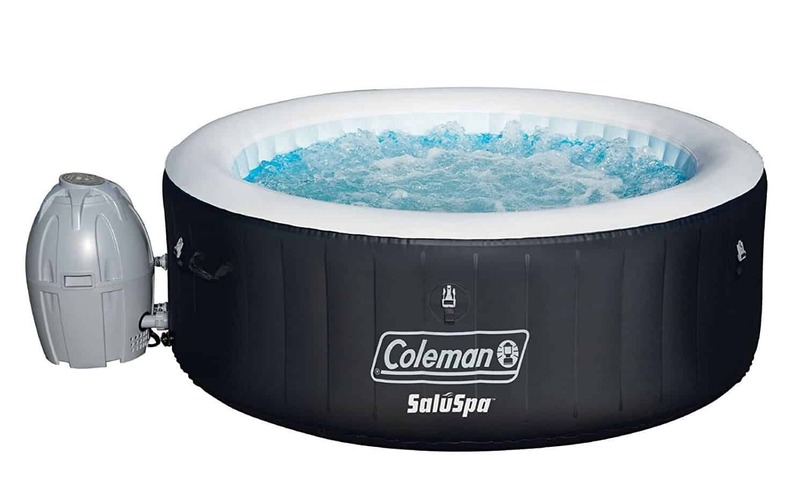 To sum up, we look at the actual performance, pricing, reputation of the brand, the warranty period offered, user reviews and durability to compile this list of highly rated inflatable hot tubs. This list of the most popular inflatable hot tubs has been put together with a great deal of care in collecting and analyzing and rating the products. However, requirements of users will typically be different and readers intending to make a purchase need to make a final choice only after going through all the specifications carefully, to understand how a particular product will meet their specific requirements. It is a well settled rule, that users decide on a choice based on actual requirements, using the reviews as a valuable reference. For instance, some users may require large 6 person inflatable bath tubs whereas others may be looking for 4 person portable hot tub. Therefore the choice of an portable inflatable hot tub spa needs to be made on the basis of actual requirements.